Top of everyone's list is the chic, sophisticated jewel in the crown city of La Rochelle. Stroll round the marina, visit the famous three fortified towers and discover the fascinating history of the city. After lunch in one of the many restaurants, browse the extensive quaint arcades and boutiques where you are bound to find a great souvenir. If boats are your thing, There is a free shuttle bus to the 1,000 boat marina or you can just watch the boats traversing the safe water channel out to sea. There is also a fantastic aquarium to visit if you need to escape the heat. With a lovely centre and marina, historic Rochefort is home to two main attractions. l'Hermioné, a full sized working replica of the La Frigate de Liberté, which sailed to America in 1780 to fight in the Civil War, and La Corderie, 17th century rope making factory and now museum of the Rochefort Martime Arsenal. The roman city Saintes has many attractions to occupy you for a day out. A museum of roman ruins, the awe-inspiring roman ampitheatre has a great audio guide detailing what life was like in roman times for the gladiators and spectators alike. In addition to river cruises, great shopping (maisons du monde and Galaries La Fayette), and generally ambling along the historic strets. Just under half an hour away, St Jean d'Angély is an adorable little town on the pilgrim route to Compostela which has kept all its medieval charm. Get a walking trail map from the tourist office and discover its secrets. Ideal to combine this with a visit to the Chateau Dampierre Sur Boutonne. Ideal for a rainy day or just to escape the heat for a couple of hours, a scenic drive takes you to Chateau Dampierre sur Boutonne, a privately owned renaissance archictural gem dating from the 15th century and situated in a picturesque little village. Guided tours in English and French. North West of Saintes, Chateau La Roche Courbon is a 15c - 17c renaissance chateau with extensive gardens offering a half-day family attraction, more with a picninc and a walk. 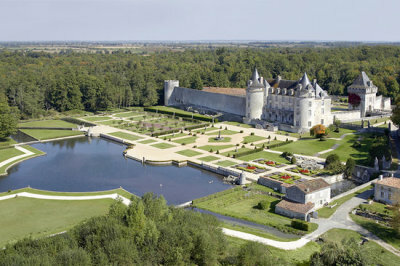 You can visit the chateau and gardens or just the gardens. Often hosts games or events, so check the web site during your stay. Good tripadvisor reviews.